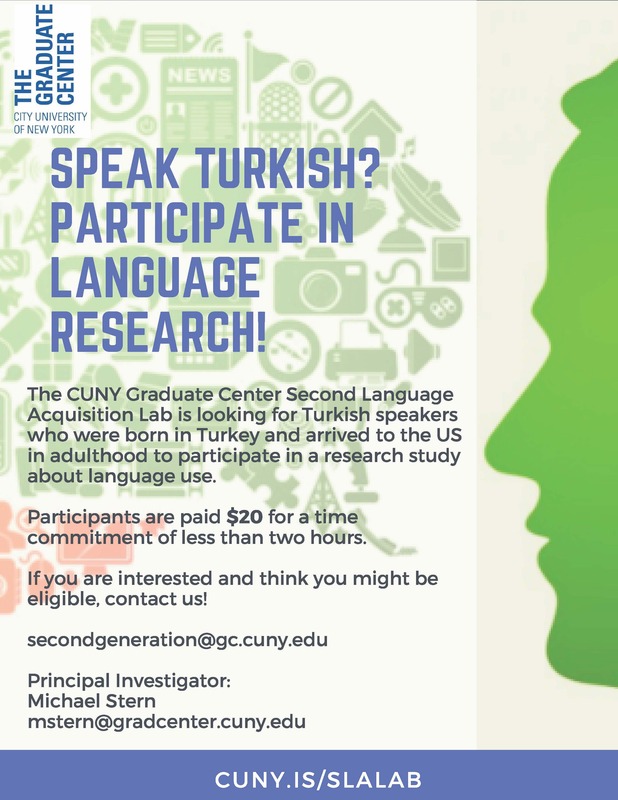 Michael Stern, an MA student in the Linguistics Program, is looking for Turkish-English bilingual adults to participate in a number of experiments for his thesis project. Eligible participants should have been born and raised in Turkey and arrived to the US at age 17 or later. The experiments involve listening to speech sounds, selecting responses on a Microsoft tablet, and speaking simple words into a microphone in both Turkish and English. The experiments can be completed in one session in under 2 hours, and participants will be compensated for their time. Please contact Michael at mstern@gradcenter.cuny.edu if you or anyone you know might be eligible and interested. 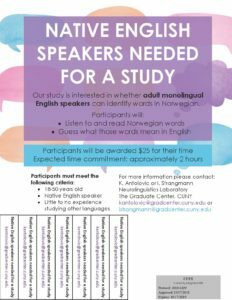 The Neurolinguistics Lab at the CUNY Graduate Center is currently seeking native English speakers for a study. Our study is interested in whether monolingual English speakers can guess what Norwegian words mean. Participants will be asked to listen to and read Norwegian words and guess what the word means in English. The expected time commitment for the study is approximately 2 hours. Participants who meet the inclusion criteria and complete the study will be awarded $25 as compensation for their time. The Graduate Center’s Teaching and Learning Center’s Open Teaching Initiative (OTI) fosters cross-disciplinary dialogues about teaching among Graduate Center student instructors. In the Fall, the OTI offers the Class Visit Exchange which pairs Graduate Center student instructors for reciprocal classroom visits and conversations about teaching. In the Spring, experienced instructors will open their classrooms to other GC instructors. Below please find the call for the Class Visit Exchange. The Teaching and Learning Center invites Graduate Center students currently teaching at CUNY to participate in the Open Teaching Initiative: Class Visit Exchange. The Class Visit Exchange pairs GC student instructors who are interested in exploring and discussing instructional methods for a reciprocal classroom visit with another GC student. Observing how other instructors develop and implement lessons, manage discussions, utilize classroom space and technology, and mix instructional methods can be inspiring and help an instructor learn new pedagogical approaches, and the OTI provides a forum to build cross-disciplinary pedagogical exchange among GC instructors while offering instructors an opportunity to strengthen their teaching community as well as discuss the advantages and challenges of various methods within the CUNY Classroom. The TLC will select and pair applicants in order to expose GC students to new teaching practices and methodologies. The pairs will participate in a reciprocal classroom visit and then attend a lunch hosted by the TLC to discuss their experience and, more broadly, teaching. All Graduate Center students in good standing and currently teaching at CUNY during the Fall 2018 semester are eligible to apply to participate in the Class Visit Exchange. Participants must be able to open their classroom and visit their partner’s class between Nov. 1st-Nov. 22nd. To apply to participate in the Class Visit Exchange, please complete this form no later than October 18. Questions about the fellowship or the application process should be directed to Luke Waltzer, Director of the Teaching and Learning Center (lwaltzer@gc.cuny.edu) and Avra Spector, TLC Fellow (avra.spector@gmail.com). Call for Objects! Call for GC Student Assistants! The CUNY Institute for State & Local Governance (ISLG) is seeking enrolled CUNY graduate students to aid in research for The Volcker Alliance’s Truth and Integrity in State Budgeting report. The project will run from September 2018 to the end of April 2019, during which the chosen student(s) will be asked to provide deep research into the workings of various state’s budgets and the processes which craft them. Students will be asked to utilize multiple sources to obtain desired information, as well as articulate their findings in a manner that a general audience would understand. Students should be able to commit to working at ISLG’s Manhattan office for at least one hour each week, as well as completing assigned work by defined deadlines. This is a paid position and a wonderful opportunity for anyone with an interest in and desire to learn more about the minutia and nuance of state budgets and government functions. ISLG will provide workshops to both train the student(s) for the project and provide a robust learning experience in local government. Students will be paid a stipend of $6,000 total for the academic year, disbursed in equal payments over the course of the year. Payments are contingent on approval by ISLG project supervisors of the work produced. Deadline: Applications will be reviewed on a rolling basis, but preference will be given to those submitted in mid-September. In-person interviews will commence shortly after submission. Training for the accepted students will begin in late September. For questions on the project, please reach out to Taylor Swabb at Taylor.Swabb@islg.cuny.edu. Application Deadline: Friday, September 28, 2018, 11:59pm. The Center for the Humanities at the Graduate Center, CUNY in collaboration with The Moth College Program, is pleased to announce a storytelling workshop for CUNY students who are family or paid caregivers for the elderly, ill, or disabled and who are looking to tell their stories of juggling work, family, school, and caregiving obligations. This workshop is organized by Kathlene McDonald as part of “The Labor of Care Archive: Caregiver Narratives from CUNY and its Communities” Mellon Seminar on Public Engagement and Collaborative Research. An all-day event on December 10th at the Segal Theatre in the Graduate Center, Performing Knowledge will feature presentations blending academic and artistic genres and forms of performance. Primarily, it asks what can knowledge feel or look like? What might the cognitive, but also emotional or aesthetic effects of knowledge be? Application Deadline: Wednesday, August 15, 2018, 11:59 pm.